a sudden sinking, others that mean a shelf. off the birds or a particularly intrepid snake. that ivy is that trails along the hem of the woods. the top drawer to set it back to right. with stones lest the squirrels get everything. light, perhaps one visible from where you are. a series of x’es across a line until the page thins. The sink has its choice of water or towel. I leave a rapid ending, a severed head. To the circles, I leave the sound of breathing. usefulness, and one who sees beauty in damage. you contemplate some otherworldly life. moves away, one holds a club, one a lion. You, too, have been hunting, I see. discarded decisions? What can hold them? I have a hand here, and reliable shoes. tell you anything you don’t already know. 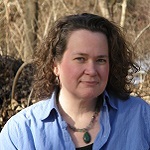 Ruth Foley lives in Massachusetts, where she teaches English for Wheaton College. Her work appears in numerous web and print journals, including Antiphon, The Bellingham Review, The Louisville Review, and Nonbinary Review. Her chapbook Dear Turquoise is available from Dancing Girl Press. She serves as Managing Editor for Cider Press Review.